Taboo takes place in the present day, in the rural South-West of Western Australia, and tells the story of a group of Noongar people who revisit, for the first time in many decades, a taboo place: the site of a massacre that followed the assassination, by these Noongar's descendants, of a white man who had stolen a black woman. They come at the invitation of Dan Horton, the elderly owner of the farm on which the massacres unfolded. He hopes that by hosting the group he will satisfy his wife's dying wishes and cleanse some moral stain from the ground on which he and his family have lived for generations. Wonderful Australian literature. Surprisingly simple white telling a complex story of the clash between ancient and modern . 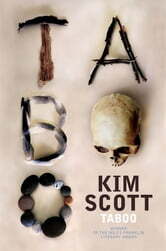 A novel of which Kim should be proud as he tells it as it is, without hatred or excuses. Take note. Thoroughly recommended. Great book. Well written but slow to start. I persevered, learnt a lot and enjoyed it.